Facebook App Knows What You’re Hearing, Watching – Digits – WSJ. Facebook launched a new feature that can automatically recognize music and television shows. Facebook’s mobile app just grew a keen sense of hearing. Starting Wednesday, the app has the ability to recognize music and television shows playing in the vicinity of users. The feature is designed to make it easier for users to share. When users begin to write a post, the Facebook app will offer to include information about music or shows playing in the background. If Facebook users share more about themselves, that can boost the value of ads targeted at some of its 1.28 billion users. The audio-recognition feature works similar to the app Shazam, which also can identify music and television programming using the built-in microphones in mobile phones. The feature took Selekman’s team about a year of engineering and logistics work. In order to recognize live television shows, Facebook inked deals to obtain audio from 160 television stations in the U.S. Using the microphone built into iPhone and Android phones, Facebook says the app can recognize a live show within 15 seconds. Facebook also said it reached deals with music-streaming sites, including Spotify and Rdio, to enable Facebook users to play previews of songs that others have shared using the audio-recognition feature. The feature is optional and can be switched on and off. 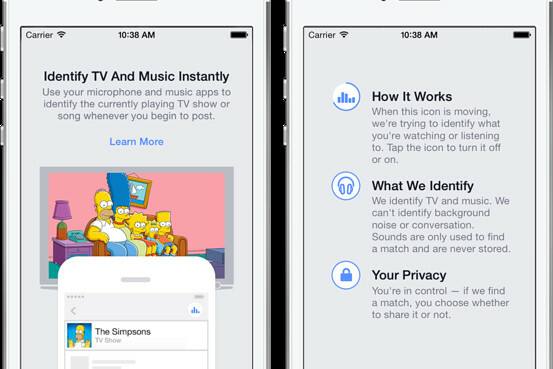 If enough users opt in, the new Feature could give Facebook enough data to start compiling television ratings. Even if users decide not to share what they’re hearing or watching, Facebook will hold onto the data in anonymous form, keeping tabs on how many users watched particular shows. Users who begin a post after turning on the feature will notice a tiny audio equalizer with undulating blue bars, indicating the app has detected sound and is attempting to match it to a song or television show. Once the app finds a match, users will see the title of the song and a thumbnail, such as an album cover or a photo of a talk-show host. By tapping on the show or song, users can post it to their news feeds and let other users know what Facebook has already figured out – what they’re seeing and hearing. tl;dr (“too long; didn’t read”) cet acronyme de plus en plus populaire dans nos journées pressées a conduit Yahoo à lancer mardi soir depuis le CES de Las Vegas une application qui résumera automatiquement l’actualité deux fois par jour en “atomes” d’infos grâce à des algorithmes: “Yahoo News Digest”. Ces atomes pourront être des tweets, des articles, des cartes, photos, vidéos, des extraits de Wikipédia etc mais les infos ne seront pas personnalisées. Du pur broadcast ! Vous l’avez compris: Yahoo propose donc désormais la version mobile et technologique du JT. Amazon lance une alternative à iTunes pour les détenteurs d’iPhone – High-Tech – Actualité – Trends.be. Amazon a annoncé qu’il allait mettre à disposition des utilisateurs de l’iPhone son catalogue musical. Il y auront accès via une mise à jour de l’application “Amazon Cloud Player”. Il compte bien en faire une alternative à iTunes. La guerre se poursuit entre Amazon et Apple, sur le terrain commercial. Le premier a mis un peu plus la pression sur iTunes, la boutique de musique en ligne d’Apple, en annonçant jeudi qu’il vendait désormais des morceaux spécialement adaptés aux appareils du groupe à la pomme. Amazon a lancé “une boutique de MP3 optimisés spécialement pour l’iPhone et l’iPod touch”, selon un communiqué. “Depuis le lancement de l’application pour iPhone et iPod touch, Amazon Cloud Player (qui permet de stocker de la musique en ligne sur un service d’Amazon puis de l’écouter en streaming ou de la télécharger, NDLR), une demande principale des consommateurs est la possibilité d’acheter de la musique sur Amazon directement depuis leurs appareils. Pour la première fois, ils ont un moyen de le faire”, a indiqué Steve Boom, vice président d’Amazon Music, dans le communiqué. Amazon espère ainsi convaincre les consommateurs de moins recourir à iTunes, jusqu’ici incontournable pour les détenteurs d’un appareil Apple et qui domine largement le marché de la musique numérique en ligne. Le distributeur en ligne avait déjà annoncé la semaine dernière une initiative visant à concurrencer iTunes, en annonçant qu’il mettrait gratuitement à disposition sur le compte Cloud Player de ses clients des versions numériques MP3 de tous les CD qu’ils avaient achetés dans son magasin en ligne depuis sa création. One Of The Biggest Stories To Watch In 2013. For years, people have been predicting the death of Microsoft’s Windows dominance. And in the last two years, it’s finally happened. The rise of iOS and Android have made Microsoft’s operating system significantly less important. Luckily for Microsoft, this hasn’t meant the death of its business overall. Thanks to the strength of its Office franchise and its Servers and Tools business, Microsoft is still very healthy. But, there’s no escaping that Windows is what drives the whole company. CEO Steve Ballmercalls Windows, “the heart and soul of Microsoft from Windows PCs to Windows Servers to Windows Phones and Windows Azure.” And that heart is beating a little bit more weakly today than it was in say, 2005. 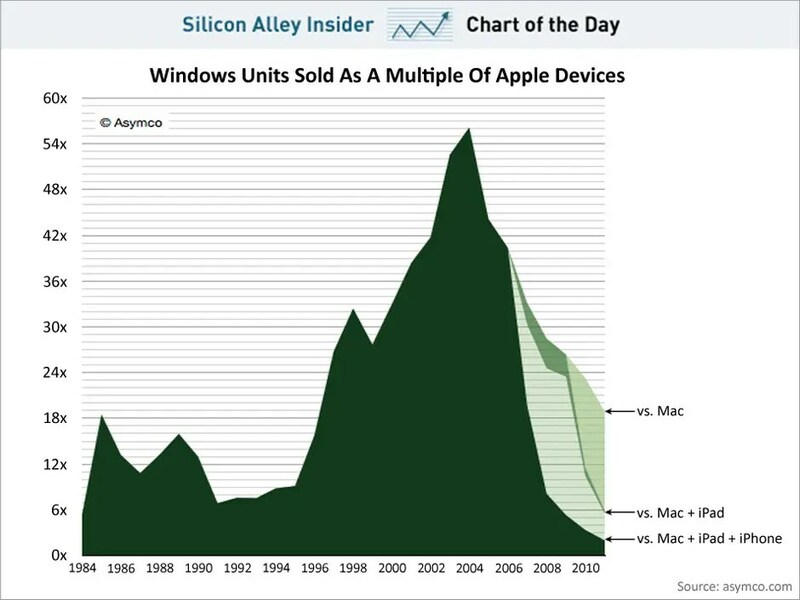 This chart from Asymco earlier this year illustrates the decline of Microsoft’s Windows monopoly as Apple has risen. There are other illustrations of the same thing here and here. Going into 2013, this will be one of the major stories to watch. Microsoft released Windows 8 in an attempt to reverse the decline of Windows’ importance. It has touch elements which are meant to mitigate the rise of the iPad, and Android. But so far, it’s off to a slow start. 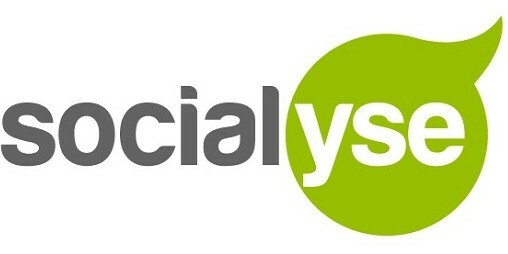 Can Microsoft reverse it in 2013? Or is this time different? Are we really, finally, seeing the end of Windows? Coca-Cola Print Ad Doubles as iPhone Speaker. Agency JWT turned Brazil’s Capricho Magazine into an amplifier to promote the country’s Coca-Cola.FM online radio platform. AgencySpy reports that JWT Brazil’s chief integration officer Mauro Cavalletti and his team at Group JWT launched the new print effort to celebrate the platform turning one year old. An ad ran on the inside cover of the magazine, with instructions on how to create the loudspeaker device for the iPhone. Starbucks coming to Apple’s Passbook before October | Digital Trends. Coffee giant Starbucks is the latest company to announce its intention to integrate its app with Apple’s new Passbook mobile wallet feature. When Apple unveiled the latest version of its mobile operating system back in June, its new Passbook app was trumpeted as one of its main features. Passbook acts as a kind of digital wallet, a place for users to store and organize tickets, boarding passes, store cards and coupons. iOS 6 launched this week, introducing millions of owners of Apple’s iPhone to the new app. Of course, it’s useless without companies supporting it, and the early indications are that, over time, plenty of businesses will go with it. A number of airlines, for example, are thought to be gearing up to integrate with Passbook – American Airlines has already confirmed its intention – while today Starbucks announced it would be offering Passport support by the end of this month. The news came via the coffee chain’s Twitter feed on Friday. Many regular Starbucks customers may already be paying for their drinks using the company’s existing app, which also allows users to manage their Starbucks Card balance, top up their card, and send friends eGifts, among other things. In 2011, the Starbucks app, available for iPhone, Android and BlackBerry devices, accounted for 26 million transactions. Passbook integration could make the process of handing over your hard-earned readies even simpler, with, for example, the app opening automatically when the phone detects its owner’s arrival at a store. But if you’re a fan of Starbuck’s current app, which evidently already has some pretty major functionality, does integration with Passbook sound like such a big deal? For a closer look at Passbook and its chances of becoming a true digital wallet, be sure to check out Geoff Duncan’s in-depth piece on the new app here. A Detailed Look At Apple’s Retail Store – Business Insider. Apple is reportedly cutting back on its retail staff because it’s interested in making its stores more profitable. We think this is a misguided decision. Apple’s stores are fantastically profitable, and the abundance of employees makes shopping at the store a pleasant experience. To illustrate how profitable, and how successful Apple’s stores are we’re republishing this infographic from OnlineMBA.com.